Rezaei, S., Bahrami, A. (2019). Cultural Identity among Iranian English Language Teachers. International Journal of Society, Culture & Language, 7(1), 67-82. Saeed Rezaei; Ava Bahrami. "Cultural Identity among Iranian English Language Teachers". 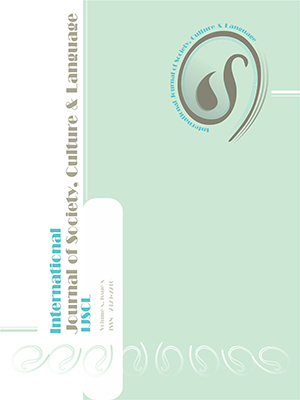 International Journal of Society, Culture & Language, 7, 1, 2019, 67-82. Rezaei, S., Bahrami, A. (2019). 'Cultural Identity among Iranian English Language Teachers', International Journal of Society, Culture & Language, 7(1), pp. 67-82. Rezaei, S., Bahrami, A. Cultural Identity among Iranian English Language Teachers. International Journal of Society, Culture & Language, 2019; 7(1): 67-82. This survey investigated the cultural identity of Iranian English language teachers. Accordingly, a cultural identity model was proposed a priori, based on which a questionnaire was developed and piloted on 50 Iranian English language teachers (α = 0.87). The developed questionnaire was then administered to 636 male and female Iranian English language teachers. The results of confirmatory factor analysis showed that the model was fit and eight components namely 1) religious beliefs, 2) history, 3) customs, 4) manners and behaviors, 5) Persian language, 6) literature and art, 7) parents’ influence and 8) family relations were confirmed to form the core of Iranian cultural identity. The findings also revealed that the older and more experienced teachers had the highest level of Iranian cultural identity. Besides, the results showed that female teachers had stronger Iranian cultural identity than their male counterparts, and teachers from different fields of study and with different university degrees and mother tongues did not significantly differ in their cultural identity.